When Simran Singh and her adopted daughter, Durga, go for a holiday in Goa, they’re not looking for any excitement. They just want to take things easy, soak up the sun, hang out on the beach and relax. But when Simran is sent a video of a young blonde girl dancing with some local men, followed by footage of the girl lying on a bed with the men, she’s instantly concerned about what might have happened to the girl. The clips have been sent to her by Amarjit, the policeman who’s her old ‘friend’ and occasional lover and he wants Simran’s help. Simran’s resistant – she’s on holiday, she wants to spend time with Durga, she’s not looking for a ‘case’ to investigate but Amarjit’s newly single, getting a divorce and might it be worth her while to help him out? Wouldn’t her mother be thrilled if Simran could get herself a man as well as a tan? 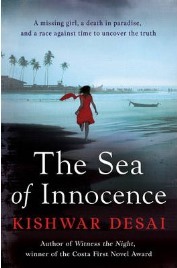 This is Kishwar Desai’s third Simran Singh novel – The Sea of Innocence. 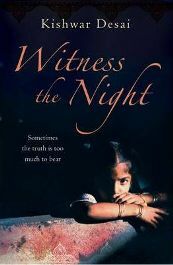 After publishing the review of Lady Kishwar Desai’s latest novel “Witness the Night” we were curious to learn more about the author and the background of this powerful story about prejudice and violence against women. Kishwar has had a long career working in media as a journalist, TV anchor and producer, as well as becoming head of an Indian TV channel. She is now a full-time writer with a weekly Saturday column in The Asian Age newspaper. She lives between London, Delhi and Goa, currently working on a biography of Devika Rani and Himansu Rai. CBF: Why did you think of gendercide as the theme for your first novel? Kishwar Desai: It was a chance encounter while I was running a TV Channel in Punjab, and one of the guests on the channel starting telling me about her life. It turned out that she had survived an attempt to give her opium and then kill her when she was born. Her story haunted me –and I kept wondering how she would feel, as an adult , looking at her parents and seeing her would-be assassins. Perhaps it’s what you hear that stops you first, a 14 year old girl found alive among the bloodstained corpses of 13 family members in a rambling farmhouse. So you begin to read with images of a book like We Need to Talk about Kevin in your mind. Could this possibly be the tale of a child serial killer? Kishwar’s Desai’s location is promising, the Punjab, not too far away in the imagination from Nithari, the place where so many women and children had been savagely murdered and where body parts appeared from the sewers.